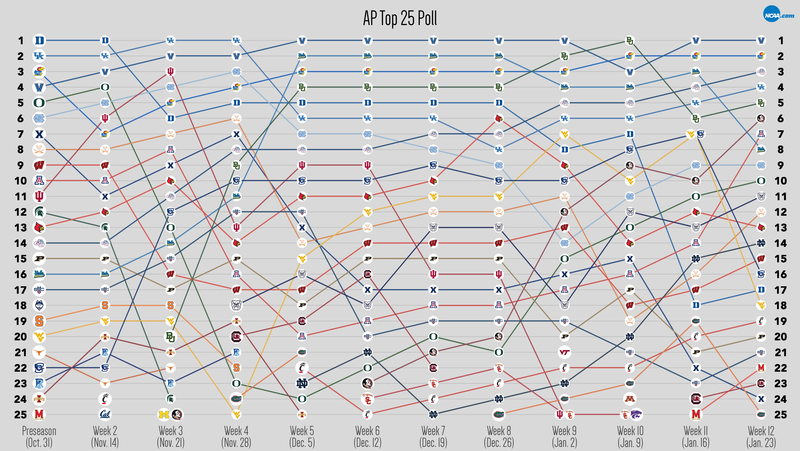 Arizona jumped seven spots in the AP Top 25 after taking down then-No. 3 UCLA on Jan. 21. The best indication of where the best college basketball teams in the nation stand may be the AP Top 25. So we're breaking down the poll here each week. 2 -- weeks this year that have had no new additions to the Top 25. Week 7 in mid-December, and this week, Week 12. 11 -- spots fallen, the largest fall this week. That was by West Virginia, which dropped from being tied at No. 7 last week to No. 18 this week. The Mountaineers lost both games they played last week, falling to unranked Oklahoma 89-97 and unranked Kansas State 79-75. 7 -- spots up, the biggest jump this week. That honor belonged to Arizona, which rocketed from No. 14 to No. 7. The Wildcats won both of their games last week, beating unranked USC 73-66 and knocking off No. 3 UCLA 96-85 on the road. 3 -- teams that didn’t move this week. No. 1 Villanova, No. 2 Kansas and No. 9 UNC, all of which played unranked teams and won, stayed put in the rankings. 5 -- weeks, the longest current upward streak. Notre Dame entered the rankings in Week 5 and fell to No. 25 in Week 7. But the Fighting Irish have steadily climbed the past five weeks to No. 14. Since those Week 7 rankings came out on Dec. 19, Notre Dame has gone 8-1, beating No. 9 Louisville 77-70 and losing to No. 10 Florida State 83-80. 2 -- spots, the longest current downward streak. The Xavier Musketeers have fallen two weeks in a row from No. 15 in Week 10 to No. 22 in Week 11, to their current spot of No. 24. In that span, Xavier was 1-3, losing to No. 3 Villanova 79-54, No. 12 Butler 83-78, and No. 8 Creighton 72-67. 1 -- team that has never dropped in the rankings this year: Gonzaga. The Bulldogs started off the season at No. 14 and have steadily climbed the ladder to their current No. 3 spot. Gonzaga is the only unbeatean team in the rankings, sitting at 19-0. 7 -- teams that were ranked in the preseason that have a net-positive ranking movement: Villanova (+3: started No. 4, now No. 1), Kansas (+1: started No. 3, now. No. 2), Gonzaga (+11: started No. 14, now No. 3), Arizona (+3: started No. 10, now No. 7), UCLA (+8: started No. 16, now No. 8), Creighton (+6: started No. 22, now No. 16), and West Virginia (+2: started No. 20, now No. 18) ). 17 -- teams that have been ranked every week since the preseason: Villanova, Kansas, UCLA, Gonzaga, Kentucky, Creighton, West Virginia, North Carolina, Oregon, Louisville, Arizona, Virginia, Wisconsin, Duke, Purdue, Xavier and Saint Mary’s. 11 -- spots, the biggest jump of any team in one week this season. That team is Baylor, which catapulted from No. 20 to No. 9 between Week 3 (Nov. 21) and Week 4 (No. 28). The Bears went 3-0 that week, taking down No. 24 Michigan State 73-58 and No. 10 Louisville 66-63. 11 -- spots, the biggest single-week drop. Duke fell from No. 7 to No. 18 between Week 10 (Jan. 9) and Week 11 (Jan. 16). During that span, the Blue Devils were 0-2, losing games to No. 14 Louisville (78-69) and No. 9 Florida State (88-72). But Oregon may have Duke beat in the anvil category. The Ducks plummeted 19 spots in two weeks from No. 4 to No. 23 with a stop at No. 13 in between (Week 2, Nov. 14 – Week 4, Nov. 28). The Ducks were 3-2 during that stretch, falling to unranked Baylor (66-49) and unranked Georgetown (65-61). 5 -- weeks, the most one team has stayed in the same position. It’s been done three times this season. Villanova stayed on top at No. 1 from Week 5 (Dec. 5) to Week 9 (Jan. 2) before falling to No. 3 for one week, then jumping back to the top spot. Kansas was No. 3 during that same span before climbing to their current No. 2 ranking in Week 10 (Jan. 9). And Duke stayed at No. 5 from Week 4 (Nov. 28) to Week 8 (Dec. 26) before dropping to No. 8.